Blue Mystic by Royal Queen Seeds is hailed as a fruity sensation, so we stuck one in the ground to see what she produced. It is safe to say, she lives up to the reputation. Blue Mystic is as mysterious of a strain as the name would imply. Although its true lineage remain shrouded in mystery, its genetics include the legendary Blueberry and Northern Lights, producing a powerful indica. Born in the mountains of Oregon and California, this indica dominant strain produces an incredibly relaxing high that you will feel all the way down to the tips of your toes. Blue Mystic feminized seeds from Royal Queen Seeds produce a hefty yield in just over eight weeks. The subtle fruity aroma mixed with a distinct berry flavor make for a satisfyingly sweet smoking experience. Coming in at 80% indica dominant, Blue Mystic takes your body high to the next level. A strain with moderate amounts of CBD, it is frequently turned to for chronic pain and a slew of medicinal uses. Blue Mystic is an excellent addition to your garden and will produce the quality cannabis you expect from Royal Queen Seeds. Blue Mystic is a truly exquisite and attractive looking plant. Trichome form over noticeably pale green and light blue buds. The buds are heavy and overly dense. You can grow Blue Mystic outdoors and expect to get around 450g per plant. Blue Mystic thrives indoors and can reach weights of up to 425g per square meter of dried cannabis. It doesn't typically grow upwards but many growers have produced high yields through topping and allowing the plant to bush outward. Blue Mystic will produce crystalline covered buds in as little as 55 days, however, by allowing it to grow to its fullest potential at around 70 days, you will be rewarded tenfold. Harvesting your plant closer to 70 days will slightly sacrifice some flavor but will produce a more intense THC-laden product. Being a heavy indica, you can expect to see the large signature fan leaves that indicas are known for. The 20% sativa makes the plant slightly more rugged which allows it to thrive in even somewhat undesirable conditions. You won't notice a heavy odor flowing from under your grow room door with Blue Mystic. With the Blueberry in its ancestry, you'll notice a fruity smell coming off your plants. A pleasant and mild aroma, it is sure not to offend your neighbors. Surprising for a strain that produces such dense colas filled with buds all the way down the stem. I cannot emphasize enough how hearty and strong Blue Mystic is during its flowering stage especially late stage. Three or four colas is all you need to get high yields from this overly impressive mid-sized indica. Blue Mystic should be grown in temperatures between 21 and 27 degrees although this particular strain has been known to do well in temperatures as high as 31 degrees. Never let your room get hotter than that as excessive heat degrades THC. Keep your humidity levels in the standard moisture zone, anywhere from 45 to 55%. Blue Mystic is a flexible plant that will do well in most indoor grow room conditions so you shouldn't have to fiddle with your set up too much. Overall, Blue Mystic is not a hard strain to grow. Maintaining standard temperature and humidity levels will lead you to shining, dense, blue-green nuggets that its legendary genetics have become known for. Blueberry, Blueberry, Blueberry... and a little bit of earthiness to seal the deal. Some say its a powerful, fruity taste with a whiff of blueberry pancakes, making this a delectable and savory addition to any weed collection. Blue Mystic is a smooth and sweet smoke, which combined with the relaxing indica characteristics, makes for an overwhelmingly satisfying journey. Right from the start you feel the intoxicating effects of Blue Mystic overtake you. It doesn't take long for the effects to plant you firmly on your couch. Being a heavy indica, many are inspired with creativity after partaking. Blue Mystic like other indicas, is great for relaxing the body and allowing the mind to wander. At around 20% THC, this indica is not to be taken lightly. Get ready to go on a journey when smoking Blue Mystic. It would be hard not to notice the tingling sensation that flows down your body; a result of the mixture of THC and CBD that classic indicas are known for. The medicinal properties of Blue Mystic are obvious as you can feel your body responding almost instantly. The level of THC and CBD together make this a fantastic strain for combating anxiety and insomnia. Blue Mystic will get you high without the anxiety that some consumers report from smoking sativas or hybrid indicas. Close to a true indica, Blue Mystic takes the edge off while simultaneously pushing you over it. If you are a lover of indicas and classic strains then Blue Mystic from Royal Queen Seeds is right up your alley. If you are looking for a strain that won't stretch out in your garden but will produce yields as though it had, this is a mighty contender. With such a renown heritage in both Blueberry and Northern Lights, Blue Mystic is an incredibly attractive strain that produces solid yields of deliciously fruity buds. It is easy to grow, even in hotter than usual conditions and will withstand the nuances of any home or indoor garden. 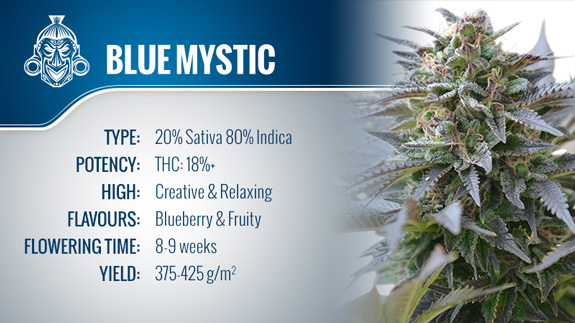 If beautiful, dense, fruit flavored buds are what you are looking for, Blue Mystic may just find a home in your garden.